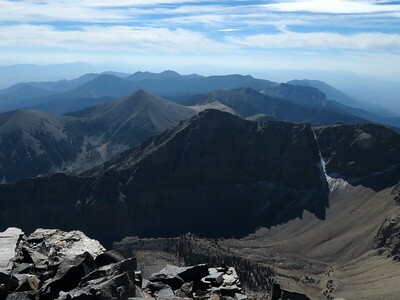 As part of a trip we did to Great Basin, Susie really wanted to attempt the summit of the second highest peak in Nevada, Wheeler Peak (13,065 feet). 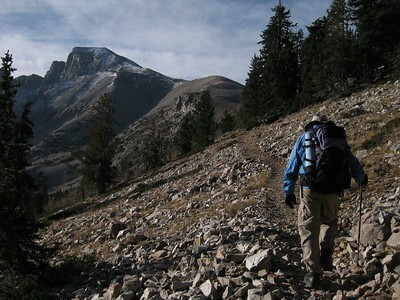 (Some folks consider it the tallest peak, due to Boundary Peak's being a subsidiary peak of a mountain solely in California.) Kelsey's guidebook shows him climbing to the summit on a rocky hiking trail in shorts and a T-shirt. That may work in the dead of summer, but in early October, it is whole 'nuther story. Nevertheless, Susie and I decided to give it a try, which made for an interesting day. 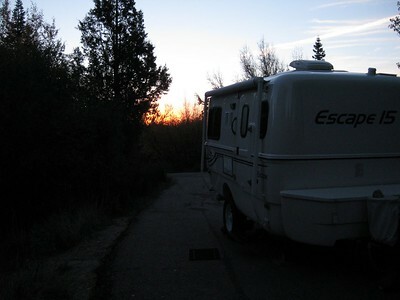 It's early morning, just past 6 am PDT, and we are up, and ready to leave the heat of our tiny trailer and head up the road for the beginning of the climb. 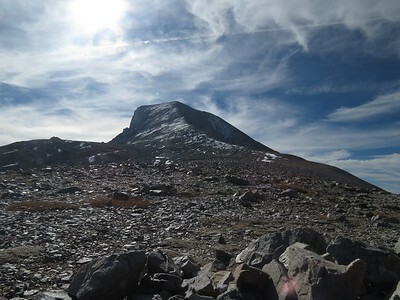 This view shows a large fraction of the climb. 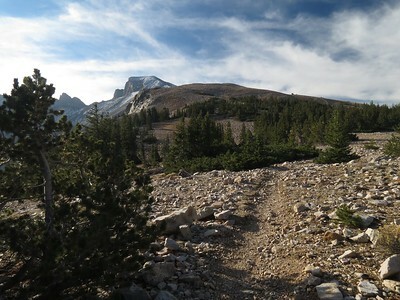 First, you hike thru woods and meadows to get to the saddle just right of center of the photo. The "trail" switchbacks up the knob in the center, and where you see snow in a gully just to the left of center, the climb gets serious. 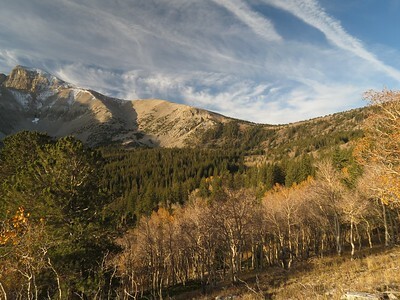 The summit ridge is at the far left of the photo. 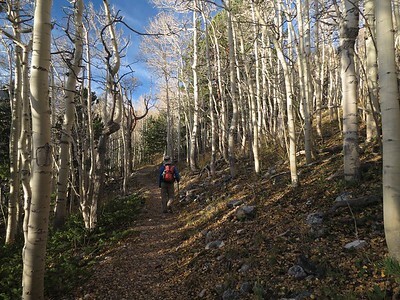 Susie hiking thru nice aspen. 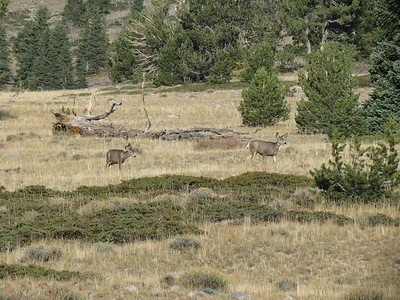 Some deer in a meadow. 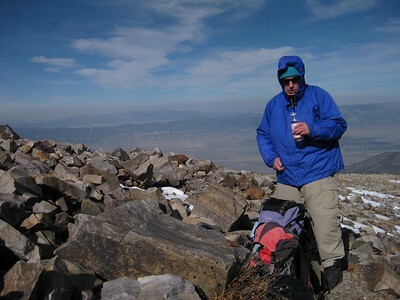 Roger looking squarely at the summit. 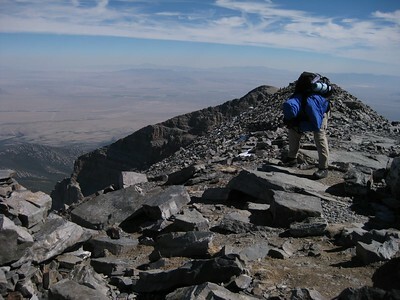 Even though the climb is slighly short of 3000 feet, it still seems a long way from here. 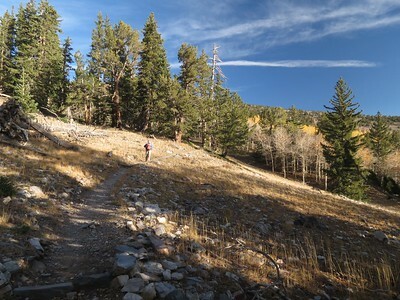 After a trail junction, a long switchback with little elevation gain. 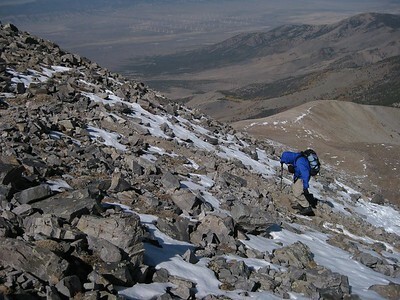 Roger climbing toward the saddle. 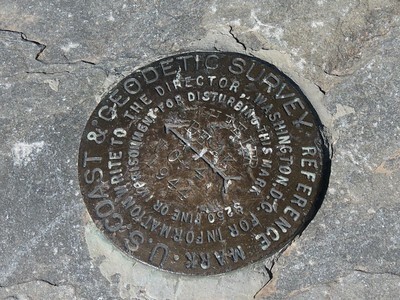 The knob just above the center will be our next objective. The morning was cool but pleasant, until we hit the saddle and started climbing into the wind. For the next few hundred yards, the scattered trees offered some protection. This shot was taken from a rock shelter about 3' high, where we stopped to get out of the wind and decide if we wanted to go on. Temps we estimate were in the high 30's, and we had sustained wind speeds of at least 30 mph. 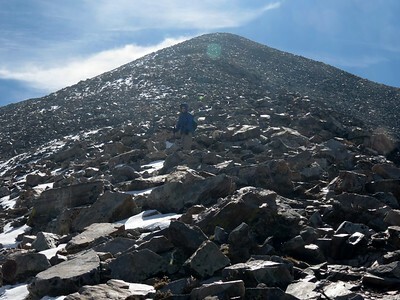 And of course, climbing above 11,000 feet when you live at 4800 feet is always a challenge. 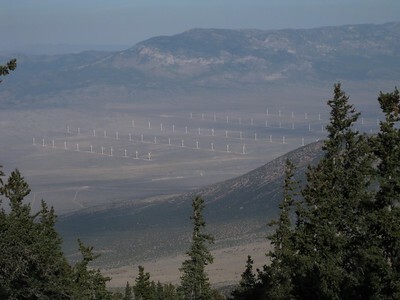 Any time you look down and see a wind farm in the valley, THAT should give you a clue. Susie had been warned by some BWAG friends to be prepared for wind. But little can prepare you for what we were experiencing. 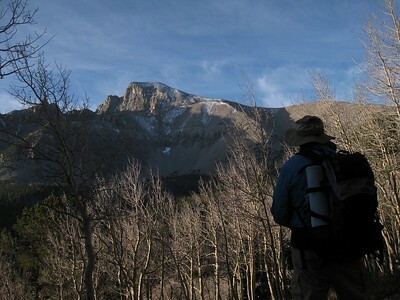 As we rounded the side of the ridge, we got a brief respite from the wind. I thought of Kelsey's photos, with him dressed very lightly. 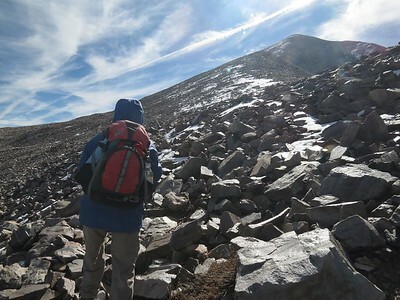 Despite the fact that we were climbing steeply, I was wearing a long underwear top, shirt, windshirt, fleece, and a rain jacket, with a fleece hat and two pairs of gloves. After our break, Susie is starting up. From this point, we have "only" 1100 feet or so to go. Yeah, there is a trail, SOMEWHERE in these rocks. But mostly, it is a path. 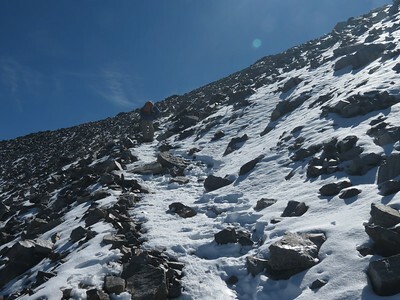 The summit ridge and route had snow on it, which made the final climb more challenging. 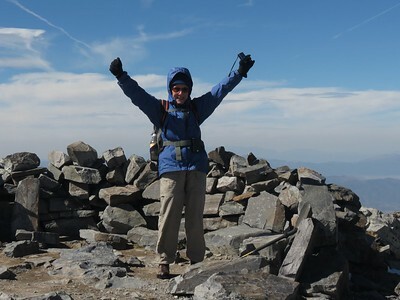 Roger on the summit ridge. 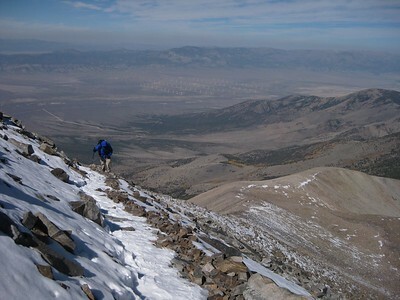 The last few hundred feet of climbing was "interesting" due to hard packed snow/ice. One had to be careful. As long as you don't slide to the left, you are ok.
A snow free (but NOT wind-free) final switchback or two. Susie has made it. And she wasn't even blown off her feet once. 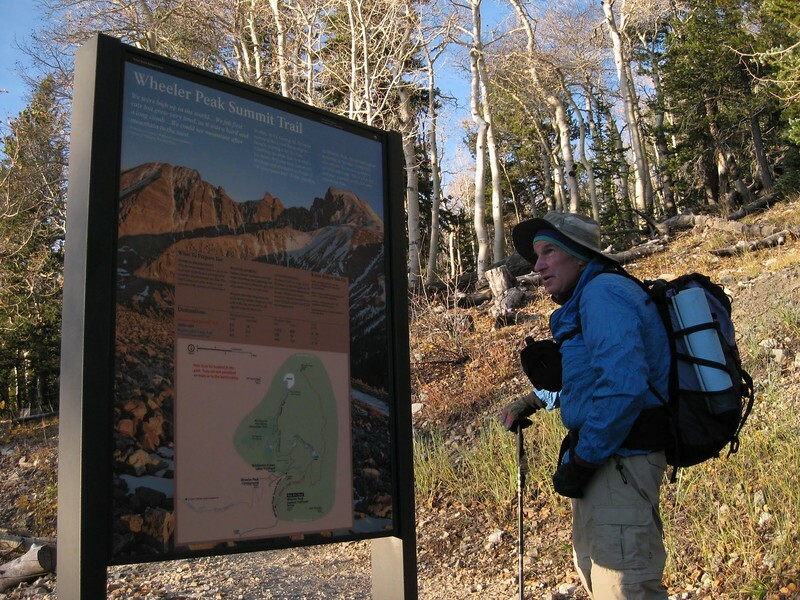 All the more reason to carry a heavy pack. Is Roger puking from the elevation? 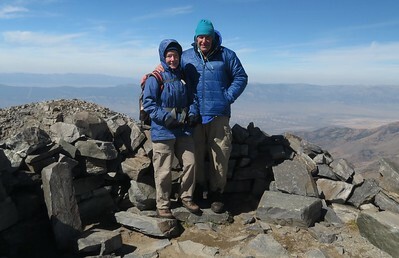 No, just taking this photo, as proof of the summit. 13,065. 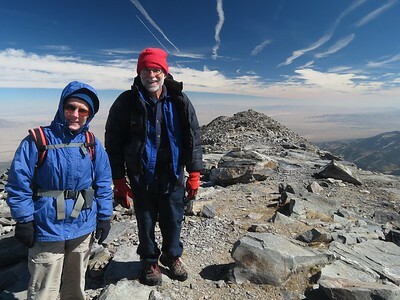 This is the highest Susie had ever climbed and the highest Roger had been since he climbed Mt. Ranier 25 years ago. This photo was taken at extreme telephoto the next day. 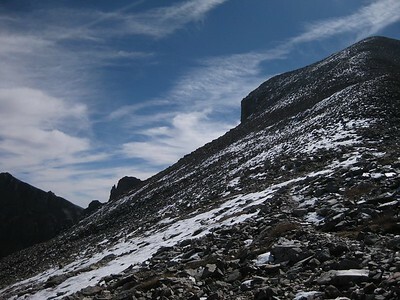 The two rightmost arrows point out the snow-covered route to the summit. (you can see why you would not was to fall and slide very far). 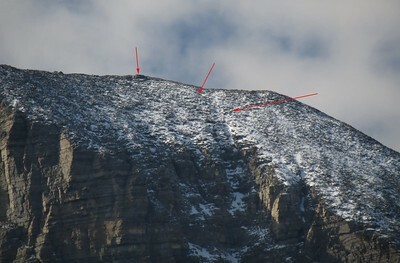 The leftmost arrow points out a near summit windbreak built by surveyers. 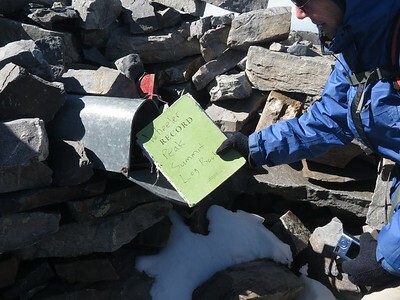 Time to fill out the summit log book. 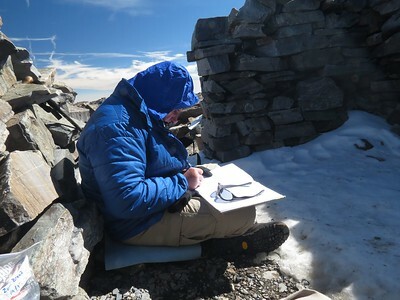 Roger filling out the log book. 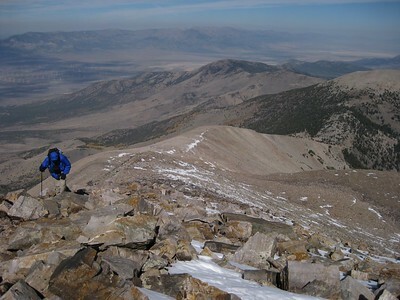 The view from the summit, looking south along the crest of the Snake Range in eastern Nevada. The gentleman to the right of Susie summitted just 15 minutes or so after us, and is a good example of why I have a hard time understanding these folks who say they have to have motors to access the backcountry. This guy had survived pancreatic cancer, and two bouts of colon cancer and was climbing with an ileostomy bag, rather than any remaining large intestine.